Toxic algal blooms, which have flourished along Florida's Gulf Coast this year, have killed off record numbers of shorebirds and other wildlife. Sick Red Knots, Sanderlings, and Ruddy Turnstones have been turning up dead and dying in record numbers as the rust-coloured blooms, know as red tide, take their toll. Always present in the waters in small numbers, the organism responsible for the blooms, the clover-shaped Karenia brevis, has exploded in the past 11 months, turning an annual nuisance into a lethal onslaught for all manner of marine life. 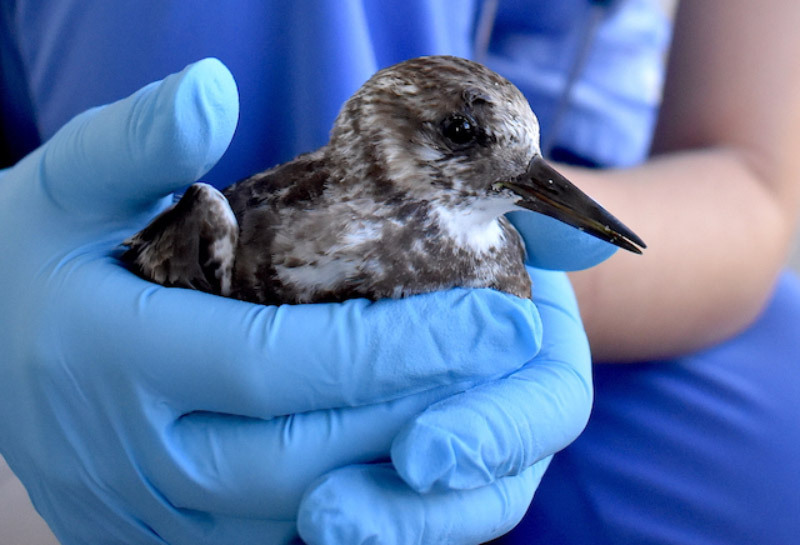 Record numbers of birds, both waders and other waterbirds, have been taken into care in wildlife hospitals. Sick from a neurotoxin produced by blooms, they are weak and precariously underweight, requiring intensive care. For example, Melissa Dollard of Seaside Seabird Sanctuary, the avian hospital in Indian Shores, has to clean out the mouths of the sick birds every hour in order to ensure that they don't choke on their own spit. She even takes the sickest birds home at night, as eight hours of care isn't enough, and they can take weeks to recover. Thousands of shorebirds, including this Ruddy Turnstone, have been taken into care with red tide poisoning this year (CROW Clinic Sanibel Island). The devastation isn't limited to birds, with literally miles of dead fish strewn across the beaches. Crabs and sand dollars from the seafloor have washed up alongside dead manatees, dolphins, and hundreds of sea turtles. For the first time since 2007, the blooms have even spread around the tip of Florida and into the Atlantic, closing beaches along Florida's eastern coast in October. The carnage is so widespread because the noxious chemical released by red tide, called brevetoxin, spreads right through the food chain and lingers for weeks. As well as fish, brevetoxin accumulates in the tissues of worms, clams, mole crabs and even insects, meaning all food is potentially contaminated. Brevetoxin affects birds' nervous systems, impacting their behaviour in a number of ways: birds may not be able to lift their wings or heads, while others act drunk. The toxin can slow their heart rate or halt digestion, leading to widespread internal infections. It is estimated that a third of the birds develop kidney failure, while parasites also exploit the birds' weakened immune systems. Many suffer from pneumonia after swallowing sea water, while others suffer from seizures. Others go blind as ulcers form across the eyelids. An aerial photo demonstrating the aesthetics and reach of the algal blooms (FRLA). 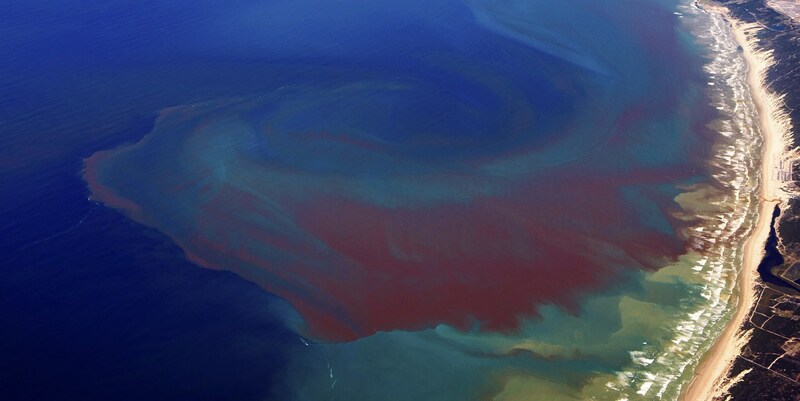 Red tide flourishes in nutrient-rich conditions and is exacerbated by run-off from farms and fertiliser-packed gardens, pollution from rivers and warmer water temperatures. Very little is known about how red tide impacts bird populations, other than it affects both nesting birds and migrants alike. For example, Black Skimmer breeding was severely hampered in Florida this year, with nesting delayed and chick growth and development rate slower than normal. Red Knot is perhaps the stand-out species among the migrants – already in serious decline, red tide is the latest in a long line of problems that the species faces. For example, the same issue has also affected the species in Brazil and Uraguay. The silver lining is that, with treatment, many birds do recover from red tide poisoning, while the issue doesn't affect all birds in the first place. Furthermore, the issue is intermittent, not constant, meaning bird populations do naturally recover. Records of red tide blooms go back hundreds of years, from the time of early Spanish explorers. However, the worry is that long-term events might be a more recent phenomenon and, with climate change already causing huge issues for migrant and resident birds alike, this is one more problem that wildlife has to face. It was hoped that Hurricane Michael, which moved through Florida in October, would clear this year's algal bloom, but it has again built up in the early days of November.